The passionflower is a fast-growing, flowering, fruit-bearing vine. The vine grows 10 feet to 20 feet in summer and dies back during winter. It derives from plants native to South America and the Southeastern United States. Harvest seeds by separating the flesh of the fruit from the pod. Allow several days for the seeds to dry in a shaded area. 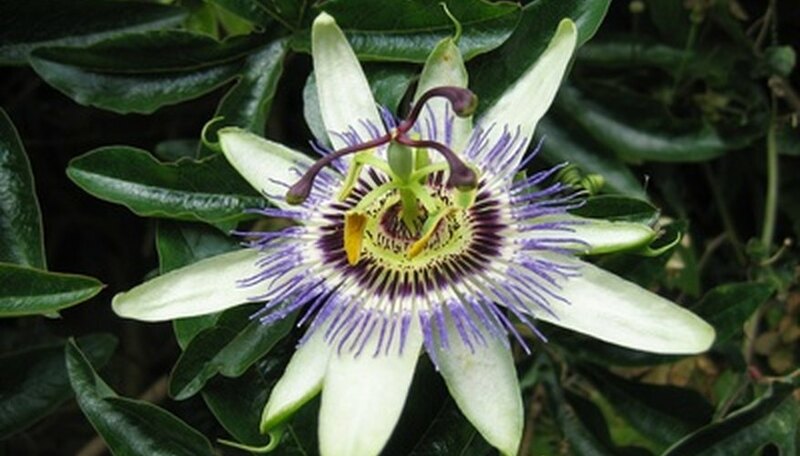 According to Passiflora Online, a passion vine seed planted in spring may not germinate until late summer or fall. It may sit dormant until early next spring. As the passion vine sprout reaches the surface of the soil, it continues to grow toward the light. At this time the roots rapidly grow into the soil to absorb nutrients and minerals. According to Plant-Care, passion vine roots are shallow and can grow in many different soil types, but they require exceptional drainage. As the leaves start to grow and unfold, the plant manufactures nutrients by means of photosynthesis. At maturity, the vine begins to form buds. The buds quickly develop into vibrant purple and white flowers. Water vines frequently to keep them flowering continually throughout summer. According to Trade Winds Fruit, incense passionflowers cannot pollinate themselves. To set fruit, the passion vine needs pollinators such as wind, bees, butterflies or hand pollination. 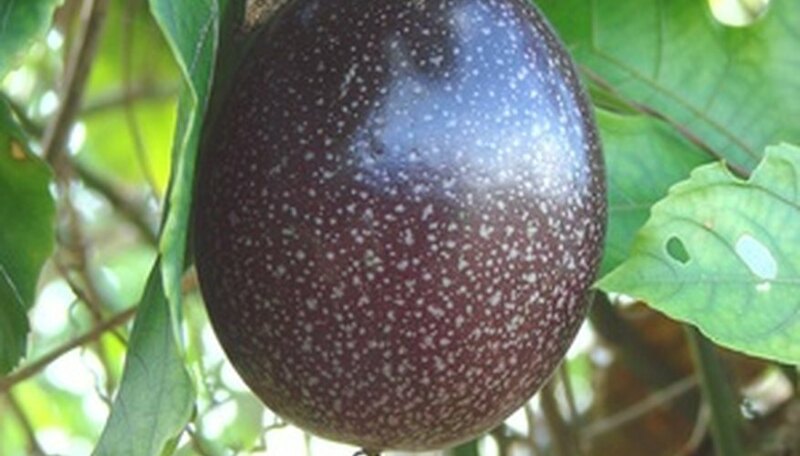 The fruit is 1 to 3 inches long and oval, ranges in colors from red to purple, and is edible. Ripe fruits that drop to the ground will decompose, allowing the seeds to develop naturally. The passionflower is a perennial vine that can live for three or more years. A strong vine will die back in winter when temperatures reach 32 degrees Fahrenheit. Regrowth begins in spring from roots or from mature woody stems. Trade Winds Fruit: Passiflora "Incense"